Bimputh Finance PLC in a noteworthy move towards enhancing customer convenience, recently joined LankaPay Common ATM Switch. Established in 2007 as a licensed non-banking financial institution that operates with the prime objective of uplifting the living standard of marginalised communities by providing them with affordable access to financial services, Bimputh Finance have come toi a firm footing with 19 branches and 31 service centres offering services to customers, mainly micro, small and medium entrepreneurs in Ampara, Jaffna, Monaragala, Puttlam, Kalutara, Gampaha, Batticoloa, Badulla, Hambantota and Colombo Districts. The partnership with LankaPay Common ATM Network brings in synergies that provide unparalleled convenience to Bimputh Finance customers by providing them with the ability to access their accounts from over 4000 ATMs island wide. Launched in 2013, LankaPay Common ATM Network now has 25 members routing nearly 3.9 mn every month. 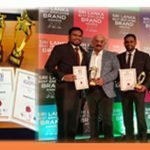 Partnering with Bimputh Finance, a non-banking financial institute that has shown commitment in providing access to much needed finances for customers of all walks of life, is an important milestone in our journey towards empowering every Sri Lankan with faster, convenient, secure and affordable payment options. Over the past 4 years our network has grown to connect 99.5% of the total number of ATMs in the country, thereby enabling customers of any member bank to, literally, access their account from any ATM in the country irrespective of their bank. By providing a common platform and a network, we are creating a level playing field for all financial institutions irrespective of their size or the financial prowess they possess whilst optimising the resource utilisation. Launched in 2013, LankaPay Common ATM network currently has 27 participants, including Bimputh Finance. Other members of the network are People’s Bank, Bank of Ceylon, Hatton National Bank, Seylan Bank, NDB Bank, Union Bank, Regional Development Bank, Commercial Bank, Cargills Bank, Habib Bank, Standard Chartered Bank, Sampath Bank, Pan Asia Bank, Nations Trust Bank, DFCC Bank, Public Bank, MCB Bank, National Savings Bank, Axis Bank, HDFC Bank, Amana Bank, Commercial Credit and Finance, HSBC, and ICICI Bank. The Common ATM Switch is the first phase of the LankaPay Common Card and Payment Switch, which is envisioned to be the backbone of all domestic electronic payments in future. The launch of LankaPay Common ATM Network in 2013 marked a significant milestone in the country’s banking sector through common usage of resources generating greater economies of scale whilst enhancing customer convenience. Consequently the transaction cost to the banks and customers have come down drastically by almost 10 fold, saving the country billions of foreign exchange that would have otherwise drained out of the country.